Vendido y enviado por Losenlli. Precio: EUR 23,55 Envío GRATIS. Zapato casual con cordones LED Light up, diseño muy exclusivo y de moda. Puede coincidir fácilmente con sus trajes perfectamente. Material suave y transpirable, muy cómodo de llevar. Caucho de alta calidad, suela antideslizante, fuerte resistencia al desgaste. Perfecto como regalo para tu amigo. 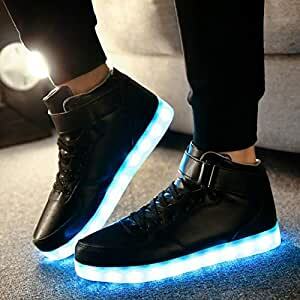 Lace-up Casual LED Light up Shoes, very unique and fashion design. Can easily match your outfits perfectly. Soft and breathable material, very comfortable to wear. High quality rubber, anti-slip sole, strong wear resistance. Each LED sneakers comes with a USB charging cable, you can plug it into laptop, portable charger to charge your light up shoes. They are a perfect choice for when you want to hit the dance club, camp out or go to the music festival etc. Impress others now with a pair of these LED light up sneakers, be the center of attention wherever you go!